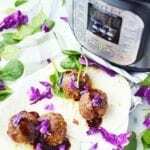 Korean Meatballs in the Instant Pot are not only quick, but totally delicious, too! Korean meatballs in the Instant Pot make a quick and easy meal with big flavors. I’ve been testing new recipes with my Instant Pot, and I love the convenience of it! 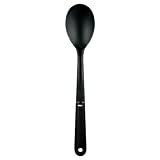 Mealtime is much quicker with this handy device. 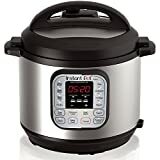 I’m super excited to offer my readers the chance to win an Instant Pot Ultra 60. Be sure to scroll down to the bottom and enter! Korean Meatballs are fast because we use the Instant Pot, so now they’re ready in just over 30 minutes start to finish. Amazing, right? Quick and easy recipes are my bread and butter. Every now and then I’ll make a more complicated recipe, but with my busy schedule, simple is the name of the game. I love that these Korean meatballs don’t require any specialty hard-to-find ingredients. Just grab a bottle of Korean BBQ sauce from the condiment aisle! I like to use a combination of pork and beef when I make meatballs. However, if you prefer all-beef or all-pork, these Korean meatballs will still be tasty. What is Korean BBQ Sauce? 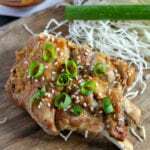 Unlike American BBQ sauces, Korean BBQ sauce is made with mixture of soy sauce, sugar, sesame oil, garlic and pepper, giving it a savory but sweet flavor. Some of the items below contain affiliate links; I am a participant in the Amazon Services LLC Associates Program, an affiliate advertising program designed to provide a means for us to earn fees by linking to Amazon.com and affiliated sites. I am also an affiliate for other programs. However, I only promote things that I love and think you will love, too. For more information, please see our Disclosure Policy. 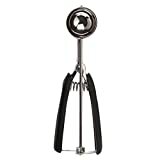 For a list of some of my favorite items to use when cooking, and why I chose them, please visit my Kitchen Resource page. Place one trivet in the bottom of the Instant Pot. Place a 4oz oven save mason jar upside-down on top of the trivet. Add 1 cup of beef broth to the Instant Pot. Place a second trivet on top of the canning jar. Place the Korean Meatballs onto the second trivet. Sauté the onions and mushrooms (optional) in olive oil. Set aside. Into a large mixing bowl, combine the ground pork and beef with the onions and mushrooms, Korean BBQ sauce, breadcrumbs, salt and pepper. Next, use a large cookie scoop to make meatballs the same size and roll them gentle into balls. Do not overwork the meat mixture or the Korean meatballs will become tough. When all the meatballs are ready, twist on the locking lid and set the valve to SEALING. Select the MANUAL mode, HIGH PRESSURE for 7 minutes. Carefully release any remaining pressure and take off the lid. Finally, remove the cooked meatballs from the Instant Pot and add to a serving dish or add to your favorite dish. *Important note: Depending on the size of your Korean Meatballs, you may need to adjust the cook time. 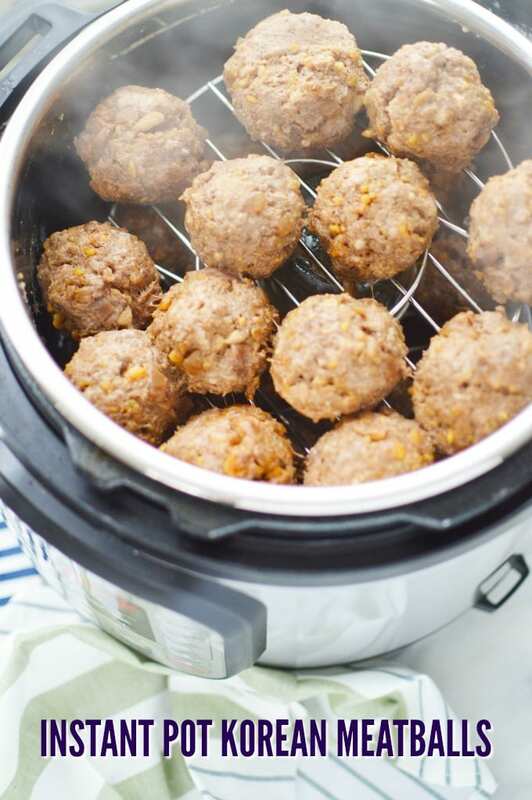 You are going to love how simple these Instant Pot Korean Meatballs are to make – and how amazing they taste! Turn a 4oz oven save mason jar upside-down and place it on top of the trivet. Add 1 cup of beef broth to the Instant Pot. This will be the liquid the steams the meatballs. When prepared, place the Korean Meatballs onto the second trivet. Sauté the onions and mushrooms (optional) in olive oil. Combine the ground pork and beef with the onions and mushrooms, Korean BBQ sauce, breadcrumbs, salt and pepper into a large mixing bowl. Use your hands to combine the ingredients. Korean Meatballs will last in the refrigerator for 3-4 days. Store them in an airtight container. This recipe makes a lot of meatballs and is great for stocking the freezer for later. Place the completely cooled Korean Meatballs into a freezer bag and label with the name and date. They will keep in the freezer for 3-4 months. When you are ready to use them, thaw the meatballs in the refrigerator overnight. Change up your dinner routine with our Korean Meatballs! 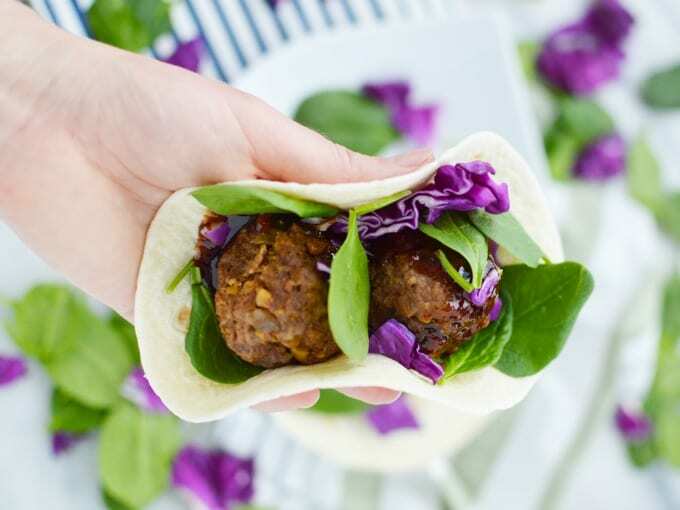 One very simple and yummy way to serve these Korean Meatballs is to make tacos out of them. They are super tasty and great for kids! Quick and easy Korean meatballs make great sliders for parties, too. 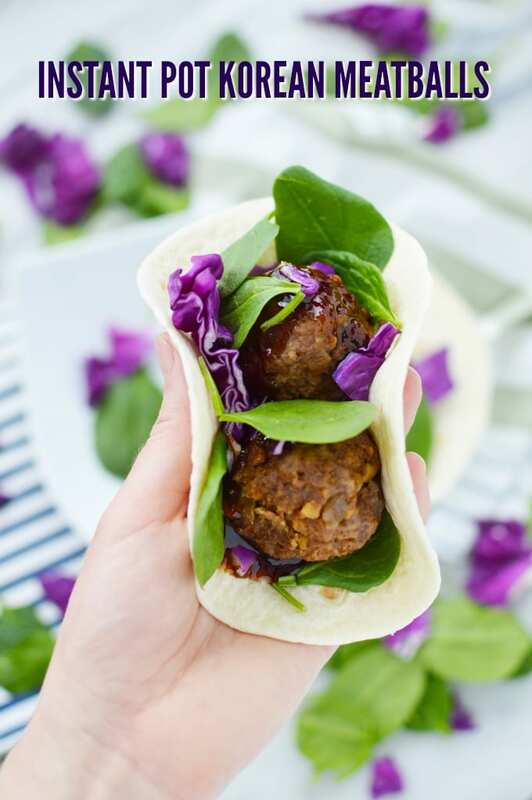 Korean Meatballs make great tacos and are also delicious in rice or noodle bowls! 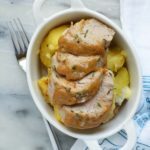 Instant Pot Pork Tenderloin Dinner – this is one of our Most Popular Recipes! Official Rules and Conditions for the Instant Pot Giveaway: One (1) winner will be chosen. Prize must be claimed within 48 hours of announcement or a new winner will be drawn. Prize will be delivered electronically. Open to US/CAN residents 18+. All entries will be verified. This giveaway is in no way associated with Facebook, Pinterest, Twitter, Instagram, Rafflecopter, or any other entity unless otherwise specified. Giveaway ends 3/29/2019. Enter using the widget below. 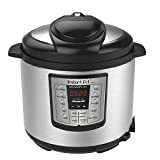 The Ultra 60 is a 6-quart 10-in-1 Multi-Use Programmable Pressure Cooker with Advanced Microprocessor Technology, Stainless Steel Cooking Pot. 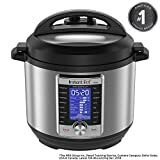 For more information, visit the Instant Pot website. You might also enjoy reading this review. For more Instant Pot Recipes, check out Instant Pot recipe app with over 850 free recipes. I’m not waiting until I win the pot, I’m making these this week. I’ll try the instsspot method when I win. Great plan, Sandra!! When I make meatballs in the oven, I put a little water in the bottom of the pan so that they don’t dry out or stick. The meatballs look amazing that is what I would try first ! Thanks Kelly! I hope you get a chance to make them soon! I would make some delicious black bean chili! I think my first meal would be some ribs and veggie medley! Oh my goodness those Meatballs look fabulous! Love your serving suggestions too – yum!!! oooo so many firsts! Chicken and Dumplings or some Ham and Dumplings. I have my Mom’s recipe that has been a favorite since I was a kid! This is so pretty, I love the purple and green. I want to make a cheesecake in tis! I would make these awesome meatballs first! Thank you for the amazing giveaway! I just got your blog update in my email and had to pop right over! I’m so glad you enjoy our emails and website, Erin! I want to try these wonderful looking meatballs. They really are making my mouth water! I love a new tasty recipe and an instapot is on my dream wish list. I’d make a beef and mushroom stew first if I won. I think the first thing I’d make is chicken noodle soup. I would like to make ribs in the instapot. Ribs in the Instant Pot is so awesome! I h ave a great recipe for Asian Instant Pot Ribs you might like to try out. I would love to try these meatballs. They look fabulous! I’ve been collecting some wing recipes from friends also. I can’t wait to get an Instant Pot. Thanks for the awesome giveaway! Hey Jason, thanks so much for stopping by! There are so many kinds of soups and stews I would love to try out. They take so long in a crock pot and on the stove . 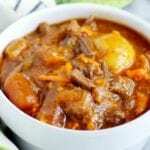 So the first thing I would make is beef vegetable stew. They are SO yummy, Kevin! I can’t wait to try these with gluten free bread crumbs. The recipe sounds delicious! Thanks for the giveaway opportunity. These work wonderful with GF breadcrumbs also, so I hope you get a chance to try them Eva! I would try the Korean meatballs first. I would make Beef Stroganoff, my husband loves it. YUM! We have a great recipe for meatloaf in the Instant Pot that you might enjoy, you can just sub the turkey for the ground beef. The Korean meatballs would be a good choice to make. They are SO yummy, Elaine! Thanks for the opportunity to win! I think the first thing I would make is French Onion Soup-I have been craving it but it usually takes so long to make! i would make a pot of chili. I probably would try some chicken recipes first. I agree, we make chicken so much – it’s nice to have different ways to prepare it. YUM! Sounds like a good plan! I would make meatballs and a cheesecake! Not together, I hope! 😉 Just kidding – both great choices! Either lamb shanks or short ribs, whatever I find a good deal on first. I would make vegetarian meat balls first If I won. Thank you for the amazing giveaway. This recipe looks delicious! If I won I would first make taco soup for my family. If I were to win, the first thing I would make are these delicious looking meatballs. The recipe seems easy enough and they are so pretty in the pictures that are posted. I’ve been craving chicken and dumplings, so I think I would try that first. But I am printing out the Korean meatballs recipe- that sounds SO good! Hi Amber, I’m so glad you’re going to give these meatballs a try! If I won I would make my grandma’s pot roast! Family recipes are so amazing, aren’t they! I like the description of the Korean BBQ sauce as being savory but sweet. I think I would try the Korean Meatballs first! I would love to try those Korean meatballs. I would like to find a good recipe for broccoli cheddar soup. I would make steak tacos. Round steak is always so hard to cook without making it tough. I would love to try this in the Instant Pot. So true, that’s a great idea for the Instant Pot! I would make some spicy spanish rice. I really want to make a roast with potatoes and carrots. I’ve been wanting to use an Instant Pot with my favorite chili recipe. I would make a pot of white beans! I would make these meatballs! YUM!! 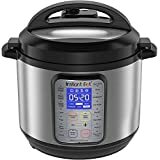 I have been wanting an instant pot and keep seeing so many easy recipes. Thanks for the chance! I think I’d try these meatballs first. They sound amazing! Thanks for your sweet note, Amy! I hope you get a chance to try them! I’d love to try this Korean Meatball recipe! My family would love it! I hope you get a chance to try it soon, Manda! 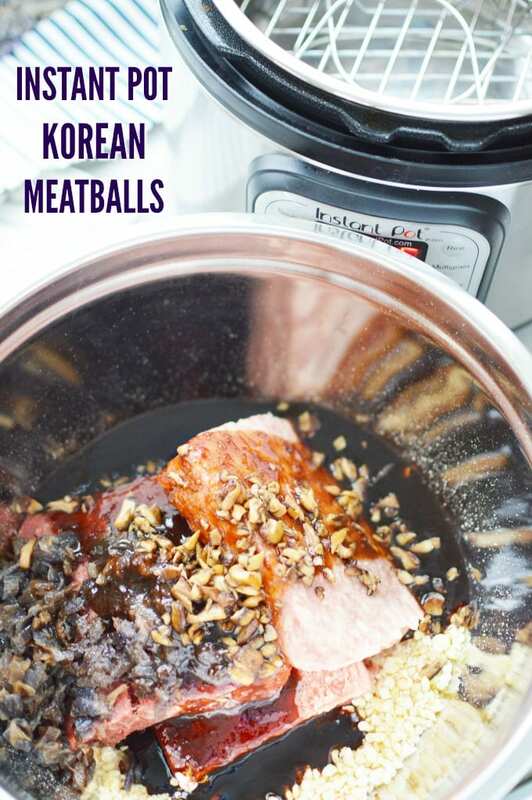 If I had an Instant Pot, I’d love to make your Korean Meatballs! They look and sound amazing! After that, I think I’d make Instant Pot Chicken Adobo. Thanks for this chance!! I would try making a Chicken stew. I’d probably start with something simple like a soup. I would make a veggie stew. maybe a veggie chili? 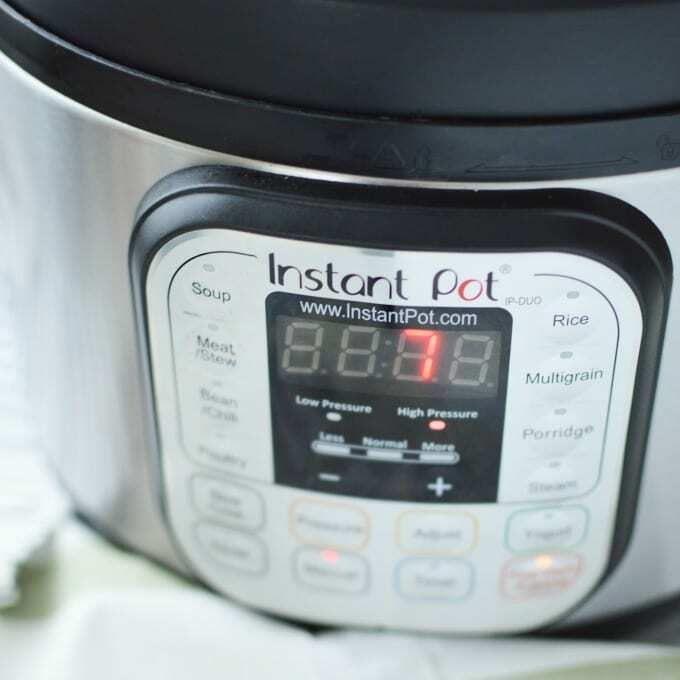 Who knows – sounds like the possibilities are endless with instant pot! I would make some BBQ ribs or a pork roast for pulled pork. The meatballs looks extremely good too. I would enjoy making a vegetarian and bean chili first. My husband would love these meatballs. Ribs, because I have heard my daughter-in-law rave about how delicious they are – and she doesn’t even enjoy meat most of the time! Would make some good old classic chili, probably some beef stew after that. Lamb shanks or oxtail soup would be my first choices, depending on what I can find the best deal on. Love them both. I wouldn’t mind trying your Korean barbecue sauce, but I’ve never liked meatballs for some reason. I would like to make cooking dinner everyday faster and easier! Don’t we all! Stick with me, I’ve got loads of great quick and easy meals. I would make pull pork or a pot roast. I think I would try shredded chicken first. 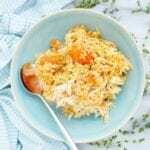 Shredded chicken is such a versatile meal-maker – great idea! Shepard’s Pie would be awesome. I have heard so much about this and I have hundreds of dishes to try out. I would make a pot of green chili stew first. Can’t wait to try the Korean meatballs. I would make pot roast with potatoes and carrots. City chicken. I’ve always wanted to try it. My grandmother used to make it when I was a child. I would make some type of roast or maybe try a whole chicken. I am not sure. There are so many great choices, maybe some baby back ribs or a pot roast. Probably as a beginner, I would try some kind of soup first…like chicken fajita or chicken enchilada. I would want to make those awesome Korean Meatballs for start. Then I would start making some of the awesome recipes that I have found on Jugglingacemama. After that who knows. I hope you get to try these soon!! Everything Louisiana ks yummy..especially beef stew. But, I just told DH the other day I need to make a meatloaf. I haven’t made one in awhile and we like it a lot. Can’t go wrong with Chili! I’ve heart the cheesecake is amazing! I’d make meatloaf! Something I love that takes too long to bake. I would make chili. These meatballs look so good. I’d first make shredded chicken with black beans and salsa. Thanks. These Korean Meatballs look awesome, but I’d probably try to make a chicken first! I’ve seen some videos of people making cake in their instapot, so I’d probably try one of those first! I’ve not yet tried that but it’s on my list! I would try and make these meatballs first. They sound really delicious! Meatballs are so versatile! I love how easy it is to change up the flavors! Beef stew is my favorite. I adore a good beef stew! Have you seen our Instant Pot Beef Stew recipe? I would make several batches my famous meatball stew which is loaded with veggies and so delicious. 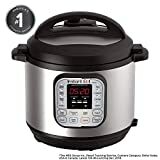 I f i won the instant pot I’d make a pot roast with potatoes and carrots. I would make a juicy roast for our family’s favorite french dip sandwiches. I’d make a black bean chili! I love food! And to make food even quicker than before….the insta pot is where it’s at! YES! Quick recipes are so amazing! They are SO yummy, Sarah! These meatballs look great! I would have to try this recipe. They are SO yummy, Janette! Thanks so much for stopping by, Bryan! I would make a mushroom risotto! 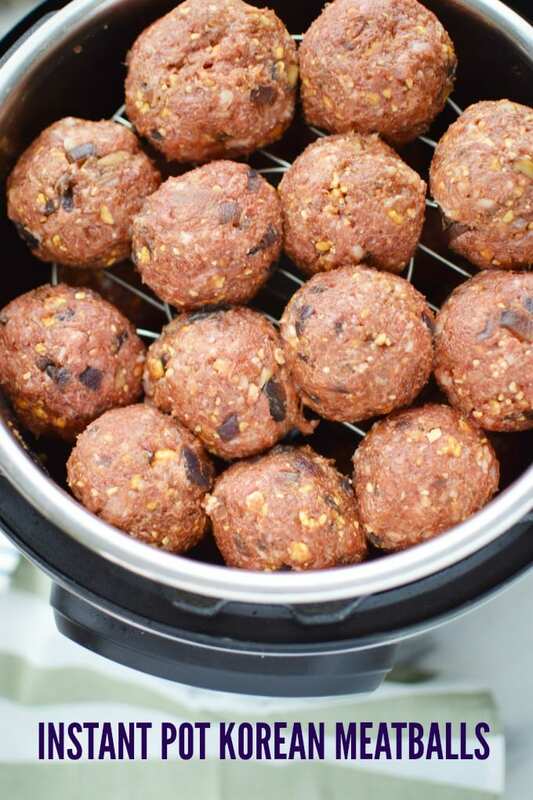 I would try these meatballs, they look great. Hi! They are SO yummy, Michelle! Yes, that sounds like a great idea! I have ben wanting one of these! I would try the meatballs they look yummy! Thank you Michel, they’re super tasty! I would make some beans! I’d make a beef stew. YUMMY! Thanks for stopping by, and good luck Judy! I would first make some delicious chili. I think meatballs would be a good first recipe to try. They look delicious. We are huge meatball lovers, so that would probably be what we whip up first! I haven’t tried Korean Meatballs before, so that might be what I try first. Those meatballs look good! I think I’d give them a try first. I’d make a stew first. Thanks so much for stopping by, Sarah! I would make pulled pork! I would make some country style ribs in it if I won! I would make pork chops first in the instant pot if I won. What a tasty looking recipe, I need to try this one! Thank you for the opportunity to enter the giveaway too! I’d make a delicious roast. I would love to make your meatball recipe, definitely bookmarking, this looks so delicious! I’d make some potato soup. Oooh!! That sounds like a great idea! All the beans/legumes!! Who has the time to watch them cook on the stovetop for 2 hours these days? RIGHT?!? This is such a time saver! That would be goulash with noodles. I thinkI’d try the Korean meatballs first, or maybe baby back ribs, depending on who I am cooking for. They are SO yummy, Ken! We also have a great recipe for Asian Instant Pot Ribs you might like to try! I would make steamed veggies and rice. I would make a cheesecake. I love cheesecake. I’d be doing a pot roast. Pot roast in the Instant Pot is so awesome! I would like to make a Kahlua Pork Shoulder! I think I would make either a chicken coconut stew or those Korean meatballs first. YUMMY! Thanks for stopping by, and good luck Sarah! The meatballs look fantastic but my mother in law makes some amazing brussel sprouts in her instant pot. My mouth waters just thinking about them!!! I would make homemade chili! I would make some chili mac! YUM! Thanks so much for stopping by, Kristi! I’d have to try my family chili recipe, just to see! I would make pulled pork first if I won. They are SO yummy, Susan! I would make a meatloaf. I would love to make the fixins for a budda bowl. I would make chili or pulled pork! Oh! I’ve never tried muffins in the Instant Pot before! I would make chicken soup first! I would like to first make cheese and macaroni. Thanks so much for stopping by, James! I would love to make some pulled pork for an easy and delicious sandwich. These look great, I’d do lasagna! I would make pot roast with carrots and potatoes. Thanks so much for stopping by, Lynne! i would follow this recipe! I would make pulled pork. I’ve always wanted to make a cheesecake and try other desserts in an instant pot! That’s my favorite soup, great choice! I would like to make chicken tortilla soup in my instant pot! The meatballs look delicious! I would make white chicken chili. What would you make first if you won? I like to make stufffed cabbages and this would make it easier and faster! I would make beef brisket first! I would love to see how doffuit turns out when cooked quicker in an instapot vs in the oven. I would make some beef pot roast, then try out the Korean Meatballs, they sound delicious! I would make turkey chili first. Thanks so much for stopping by, Marlene! I would try to make these Korean meatballs if I got an IP. Looks so good! I would make low carb Pizza Soup! The meatballs look great. First I might make a beef roast! I would love to make the meatballs or maybe a roast! I would probably do a chili first! I love chili! 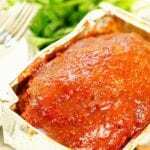 Such an easy meal, inexpensive and filling – great choice Melissa! Mac & Cheese! 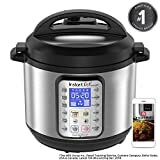 It’s my favorite comfort food and I would use my instant pot all the time for rice and trying new recipes. 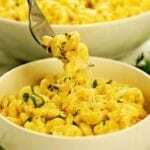 Mac and Cheese is my FAVORITE! I’d make vegetable beef soup. Those meatballs look amazing and I would love to try shredded meats and chicken recipes. My mom has a great pot roast recipe that I know I can adapt to a Instant Pot so I would try that first! I would make these meatballs. They sound really yummy! We like venison and I cook it in a slow cooker. 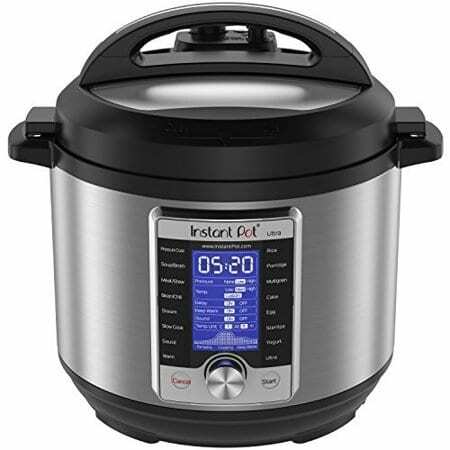 I would love to try the instant pot for the venison! I’ve never tried venison before actually, but this sounds like a good plan! I would actually try to make meatballs! They are so yummy! If I won I would make some of those Korean meatballs first . They look delicious. I would make Greek stew! I would try these meatball first. My husband loves meatball and I am sure these would be better than the packaged ones I buy. I bought my two sons an Instant pot for Christmas, but didn’t get one for myself. The boys tell me all the time how great these are. I’d love to use it to make corned beef. I would try the Korean Glass Noodle Veggie Stir Fry by The Forked Spoon. Yum! Thank you for the recipes and the giveaway! I would try spaghetti! Giveaways are always such a fun way to connect with my readers! I’d love to try this meatball recipe! I would make Korean short ribs first in the Instant Pot for fall-off-the-bone goodness! I would make vegetarian stew. I think I might try those meatballs. They sound tasty. I have a recipe for chicken enchiladas that I’ve been dying to try, so that’s the first thing I’d make. Of I was lucky enough to win I would make a chicken Chili in it thanks for the chance to win! I would make chilli or bbq puled pork. If I won, I would make either chili or pot roast first. I’d make a chicken soup! I would try this meatball recipe, and then make a cheesecake. I would try making a roast first. I would make a chicken and rice dish. I’d like to try hard boiled eggs. I would love to make a roast and potatoes! I would love to make a vegetarian Italian Meatball Soup….. I hope you get a chance to try them soon! I would make chicken wings first. I have to start out easy. Probably just a simple pot roast. We will see after that. Hi Samantha! Modeling good eating habits is so important for kids! Great job being more healthy. Thanks for stopping by, and good luck! I think I would make a Frittata Breakfast Casserole the first time I use it. I would probably make soup or some kind of casserole. My neighbor has an instant pot and absolutely loves it! Thanks for stopping by, Kelly! Chicken Breast with cream cheese and spinach. I would make swedish meatballs! I would have a hard time choosing what to make first if I won! I heard nothing but good news about the Instant Pot. Would love to try for myself. Thanks for stopping by, Natalie! I would love to make my sweet and sour chicken recipe. So many recipes, so little time! I would try some good old Carolina BBQ! I would make spicy homemade chili. I would make chicken lime shredded chicken with jasmine rice.